Tommy Brown was born on May 27th 1931 in Atlanta, Georgia. His father was a Methodist Preacher but it was his uncle � a Buck Dancer � who gave him a liking for the limelight and taught him how to dance. At the age of six he began his professional career dancing at �The Top Hat Club� and the �Five O�clock Supper Club�. His early musical influences were Louis Jordan and Cab Calloway. The latter�s brother, Elmer, was a teacher at Tommy�s school and he nurtured the boy�s interest in R&B. Tommy�s first instrument was the piano but he eventually switched to playing drums in the school band. He formed his first R&B band �The Maroon Notes� after enrolling into the Booker T Washington High School and they soon began to make noise locally. By 1949 The Maroon Notes were regularly playing the prestigious �Royal Peacock Club� and it was there that Tommy saw both Roy Milton and Ivory Joe Hunter. These two men made a huge impact on the young man � Milton because he was a drummer/singer and Hunter because of his mellow tone. Shortly after seeing Milton he sacked the Maroon Notes singer and assigned that role to himself. In the same year, probably because of his success with the Maroon Notes, Tommy landed himself a regular fifteen minute live slot on radio WERD as Sweet Poppa Tommy Brown. In turn this led to his picking up work playing lucrative white college gigs. Business was good with work available 24 hours a day. During this time The Maroon Notes would regularly back, or open, for big names that were travelling through town like Chuck Willis, Titus Turner, T-Bone Walker, Roy Hawkins, Melvin Smith, Clyde �Blowtop� Lynn, Little Richard and especially Billy Wright. Billy had an overnight success with a recording that he made for Savoy in 1949. Unfortunately for him he did not have a working band of his own but fortunately for Tommy the �Maroon Notes� suited Billy�s needs perfectly and they travelled together the length and breadth of Georgia and Alabama. It was from this outlandishly gay singer that Tommy learnt �stage presence� and how to entertain an audience. In 1950 Tommy recorded �Fat Hardy�s Boogie� as vocalist for band leader Roy Mays� obscure outing for Gerald Records. In January the following year he recorded a great quartet of numbers including the wonderful �Double Faced Deacon/V8 Baby� with members of the �Maroon Notes� including the brilliant Grady �Fats� Jackson on tenor. A couple of months later Tommy was offered a chance to tour and record with the �red hot� Griffin Bros who were riding high with �Little Red Rooster� but whose vocalist Margie Day had laryngitis. Tommy sang on the Dot recording �Tra La La� which was rush released the next day and shot up to number 7 in the billboard charts. Then in November of that year he was back in the studio recording what was to be his biggest hit �Weepin� and Cryin�. Unfortunately, by the time the record was released, he had been inducted into the army and was not able to enjoy the record�s success. He was demobbed nine sad months later when all the fuss was over. Having not been paid by Dot Records he decided to go back to Savoy and record a Weepin� and Cryin� part 2 type song �No News From Home� which deservedly went nowhere. Much better was the 1953 recordings by the great pianist bandleader and talent scout Sonny Thompson in Chicago which were released on King as by Little Tommy Brown. The Jump Blues �How Much Do You Think I Can Stand� was particularly outstanding. A year later he records again in Chicago for United Records and this time he is backed by a Chicago blues band including Walter Horton, Willie Dixon and Memphis Slim. This sounds like a recipe for disaster but I like them well enough, particularly Willie Dixon�s brilliant �Southern Women�. In 1955 he enters the studio in New York and produces another quartet of numbers with RCA�s houseband including Mickey Baker on guitar, Ernie Hayes on piano and Sam Taylor on tenor sax. Meanwhile, unbeknown to him, he began to work for the mafia in white clubs like the Club Delisa and Martins Corner as a dancer, blues singer and comedian. By the time reality dawned it was thankfully not too late to withdraw to Cincinnati with all limbs intact. Here he met and befriended Bill Doggett and was asked to join Doggett�s band as a singer and drummer. He entered the studio in September 1956 and recorded a vocal version of Doggetts earlier huge hit �Honky Tonk.�This in turn made the charts (Shor�ty Billups recently sang it at his Shakedown concert). Then in 1957 Dave Bartholomew asked him to go to New Orleans to record for Imperial Records which resulted in two single releases including a great shuffling rocker �Someday Someway� With accompaniment from the elite of New Orleans musicians including Lee Allen and Red Tyler on sax and Justin Adams on guitar this was wonderful music. Unfortunately the times were changing, work became difficult and Tommy went back to being a comedian, dancer and sometime singer. For the next twenty odd years he made a good living working comedy clubs and issuing recordings of his risqu� comedy routines on �adult only� records in the tradition of Red Fox and Mighty Hannibal. His act did include the odd song which apparently also found their way onto these recordings. In the 80�s he quit the music scene and inherited his mother�s Care Home business and he spent his time looking after the aged. In 2001 Tommy was persuaded to fly to Holland for the famous Blues Estafette and as I recall his show was the highlight of the evening. With honking sax�s and a heavy beat we were transported back to the 50�s by a true entertainer of the old school. Dancing and jumping the audience loved it and so did he. Since then he has recorded an excellent album for Boneyard Records and released a compilation of his early work on his own Chitlin� Circuit Production label. He came over to England a few years ago for the excellent Rhythm Riot and I am reliably informed by Big Joe Louis that he was again the highlight of that weekend. 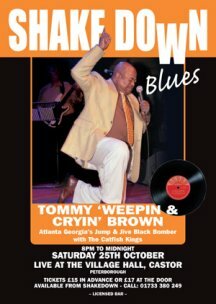 For the Shakedown gigs Tommy was be backed by Harry Lamb�s Catfish Kings.